Roux making is a fairly fundamental cooking technique that I hope to teach you in this cooking video. 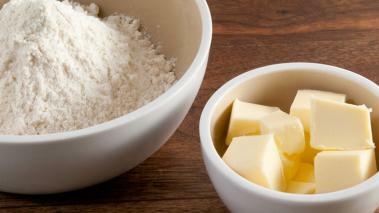 At its most basic, a roux is a very simple thing – the combination of fat & flour. For most rouxs the fat used is butter, but it doesn’t have to be…using the drippings/fat from cooked meat for example is very common. The purpose of roux is also very simple – they allow us to thicken liquids into sauces so they have more viscosity and body. The only "trick" if you can call it that, is that you have to make sure to cook the roux before use, otherwise it tastes pretty raw. Check out the video, and the tips below, and you'll be making rouxs is no time. The first question I always get is how much roux do I need; and that question is tough to answer. A roux thickens liquids, but there is no standard definition of "Thick"…so what you think of as very thick, I may think of us slightly thick – that’s the problem. My general rule of thumb is to use about 2 tablespoons of roux per cup of liquid. The mixture should have the consistency of loose paste or glue; not runny, nor clumped together in a ball. If it is either, add a bit more butter or flour. A standard roux is the start to some great food. Two of the five French mother sauces velouté and béchamel both start with a roux. I’ll also make a quick roux with the pan dripping after cooking pork, chicken or steak, and add a bit of stock for an instant pan sauce. Hope you enjoy. You can also add slices of cheese to make a cheese roux- I use it to make Creamed Tuna wi veggies and place over Basmati rice!